If you’ve been laser focused on getting your home organized, you’ve likely spent a considerable amount of time with everyone’s closets. Tossing things you don’t want and finding a place to put the things you do want isn’t always that easy; you need a system that will support you, too. While small containers can certainly help, sometimes you need a complete overhaul. 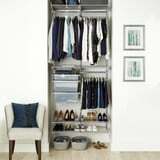 If an all-in-one closet organization system is calling your name, here are some inspirational ideas and items to shop.